Nendaz is located in the heart of the 4 Valleys region, and has access to Verbier, Thyon and Veysoonaz. It has a charming, historic centre, with modern chalet-style apartment buildings expanding outwards in recent years, accommodating visitors at reasonable rates. Nendaz is fast becoming much better known in the UK, but has long been a favourite of European skiers. The resort has been given a special accreditation by the Swiss Tourist board for its family friendly credentials and is slap bang in the middle of the marvellous 4 valleys region (next door to Verbier), which is one of the largest and most highly-rated areas in the Alps with over 400km of pistes and fantastic off piste. There's great walking/biking during the rest of the year too, plus an outdoor jacuzzi - (lifts stay open until September). 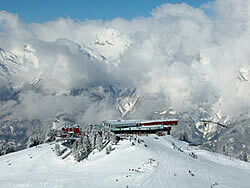 Haute Nendaz has rapidly become a much sought after location with many great restaurants. The ski schools are excellent & the 'kids' area' at the top of Nendaz (reached from the Tracouet lift in Nendaz village) is huge, safe, great fun, and has a very good bar/restaurant as well! The glacier on Mont Fort in Verbier provides not only the year round skiing for the area, but some of the most challenging as well. The inter resort lift connections are excellent, so you can stay pretty well anywhere you want, and still enjoy the whole network of ski runs. It's linked in to all the other areas on one lift pass and takes less time to get to the top of Mont Fort (3,300m) than it does from Verbier. For beginners Nendaz offers a couple of gentle areas well out of harms way, and for experts the place is a veritable paradise. For those in between get a lift map and choose carefully. There is plenty of good middle ground, but this is a big area. If you are skiing far away from your home base head for home in plenty of time. In summer time the area has an enormous choice of walking, particularly special are the "bisses" - irrigation canals dug or carved into rock by the local peasants to capture melting glacier water and transport it to their crops. Running alongside the bisses are paths that will take you through the valleys, villages and mountains with spectacular scenery at every turn. For mountain bikers there are varied trails, with something for everyone from beginners to experts. The Tour du Mont-Fort for example, is a bike route that offers the opportunity to visit the resorts of Nendaz, Verbier and La Tzoumaz. There are two levels of difficulty to choose from, moderate and advanced. Other summer activities include golf, (at nearby Sion - 20 mins drive), paragliding, rock climbing and much more. wide choice of restaurants, ranging from traditional to modern. a reasonable choice of bars, with theme music evenings, live music and a nightclub. walking trails,train links to Martigny and Montreux.